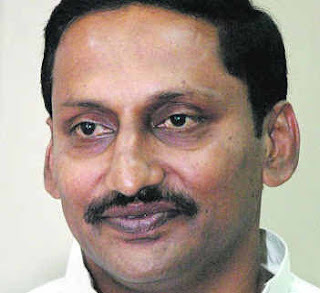 eNLokam: Kiran Kumar Reddy the new Chief Minister of Andhra Pradesh! Kiran Kumar Reddy the new Chief Minister of Andhra Pradesh! Kiran Kumar Reddy was sworn in as the new Chief Minister of Andhra Pradesh. This is after the resignation of K Rosaiah citing health reasons. The two big challenges for the Congress in Andhra Pradesh, a rebellious Jagan Mohan Reddy and the Telangana issue, will now be tackled by the new Chief Minister. Reddy is a four-time MLA from Rayalseema region and a YSR loyalist. K Rosaiah stepped down citing personal reasons. Senior Congress leaders from Delhi, including Finance Minister Pranab Mukherjee and Law Minister Veerappa Moily, who is also the General Secretary in-charge of Andhra Pradesh, met with Congress MLAs in Hyderabad. At last Sonia Gandhi made the selection of the new leader. Reddy was the Speaker of the current Assembly, and was the Chief Whip of the Congress in the previous government of YS Rajashekhar Reddy. Reddy was first elected to the state Assembly from Vayalpadu constituency in Chittoor district in 1989 but the lost the election in 1994. In 1999 and 2004, he was elected successively from the same constituency. He had to shift to Pileru constituency in 2009 because of delimitation. Above all he was cricket player. He has played first-class cricket for Hyderabad. We shall hope that his skills in the cricket field may help him to tackle the opposition in the political field?! Catholic priest sexually abused 155 children!! !